[By Nick] After my disappointing experience with Edy's Limited Edition Banana Split, I was on the hunt to find a proper banana split in a prepackaged form. Actually, that's a lie and this throw down has been about two years in the making. The problem was I could never find either of the two flavors. Thankfully my dad found me a pint of Banana Split (still in its old packaging) and with Haagen-Dazs chaning their Banana Split to a limited edition flavor, it suddenly became a lot easier to track down. so let's get on with this Split errrrr showdown! Here are the rounds and criteria I'm looking for. First Round: Looks. While I'm not expecting it to look like a banana split, I want all of the components to be visible and appealing. Edy's severely lacked in this department with it's two sparse swirls. Second Round: Taste. While you'd think I'm looking for? an ice cream to taste like a banana split, that's not the case for this round. If the components work together without tasting like a banana split, that's fine with me. Names only mean so much when it comes to taste. Third Round: Banana Split Likeness. Now this is where the banana split experience comes into play. I'm going to determine how close to a banana split it looks, tastes and all around makes me feel. If it's a proper banana split, it should spark some nostalgia. Neither of these are all that pretty to be honest. At least you can see the components each have to offer easily. This one is tough but I'm going to give the nod to Ben & Jerry's just because it appears that more is going on. Ben & Jerry's tastes a lot like Chunky Monkey just with a bit more chocolate flavor to it. That isn't all that surprising seeing as all they've added was a fudge swirl and strawberry ice cream. The latter doesn't make much of an impact though. The strawberry flavor is dominated by the banana base but at least I like this one more than Chunky Monkey. 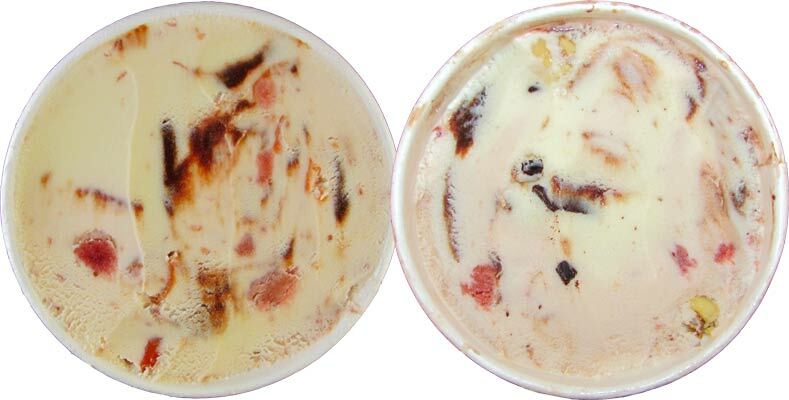 That added fudge swirl adds a lot to the flavor profile making it more of a composed treat. The walnuts are the same exact thing you find in Chunky Monkey. Nothing great but not bad either. The main problem here is the strawberries pieces. They're a little on the icy side and that's never a good thing especially when they're not contributing any flavor. As for Haagen-Dazs, I was a little weary of their banana base after my experience with their Caramelized Banana Chip gelato. Thankfully that's not the case here. The banana base isn't too ripe and is actually very mellow. That might have to do with the whipped cream ice cream. It's more reminiscent of a sweet cream base but it's enjoyable none the less. The cherries are ample and have a natural, freshness to them. Their sweet tartness goes well with everything, they don't suffer any of the flaws that Ben & Jerry's strawberries had [*technically H-D has strawberries as well, but I did not notice them]. 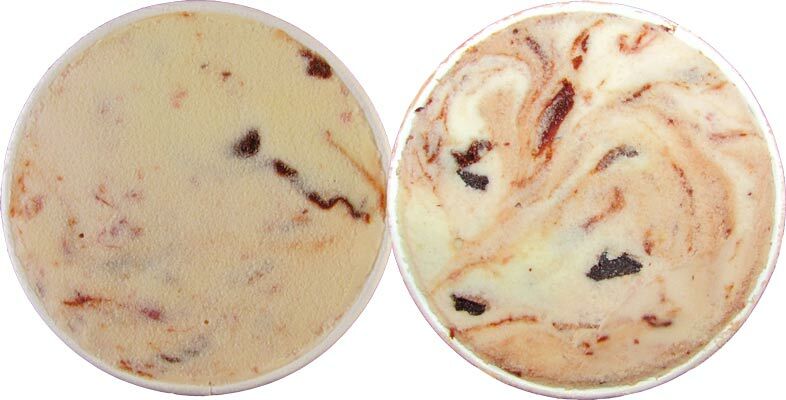 Lastly, you have the fudge swirl which is right on par with Ben & Jerry's. It's thick but comes off with more of a dark chocolate profile which lends itself well to all the other sweet components. If you couldn't tell, this round easily goes to Haagen-Dazs. Last round, let's do this. Now neither of these actually reminded me of a banana split. The problem with both is that they don't contain the majority of components you'd find in a traditional split. 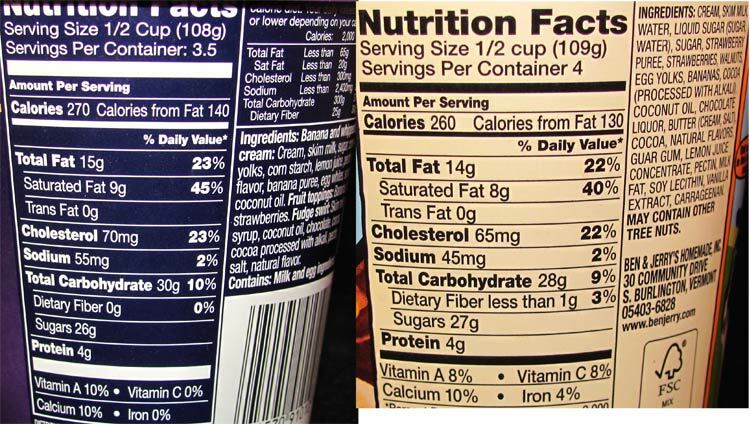 While Ben & Jerry's did use a strawberry ice cream, the chocolate and vanilla scoops weren't represented in either flavor. Haagen-Dazs did have the whipped cream with a cherry on top factor but Ben & Jerry's included nuts. If these flavors were to be combined, you might get something close to a banana split but as is, these are just different beasts. Neither of them truly spark that nostalgia I was talking about so neither of them get the win for this round. So this was close but when it comes to the superior flavor, taste always beats out looks making Haagen-Dazs version the winner. Seeing as I have yet to find a sufficient banana split ice cream, I'm asking you guys to give me suggestions. I know both Turkey Hill and Friendly's make banana split flavors that I've yet to try. Are there any other companies doing it as well that I'm missing? Let me know! I definitely love HD's Banana Split. Blue Bell makes a really good Banana Split ice cream so try that one next. Jenny, I'd love to try Blue Bell but I live in the North East and they're not available up here. BLUE BELL MAKES A DELICIOUS ONE SO GOOD. Anon, welp that makes two people suggesting that flavor. I guess I need to take a trip down south! I've also been on the hunt for a good banana split. 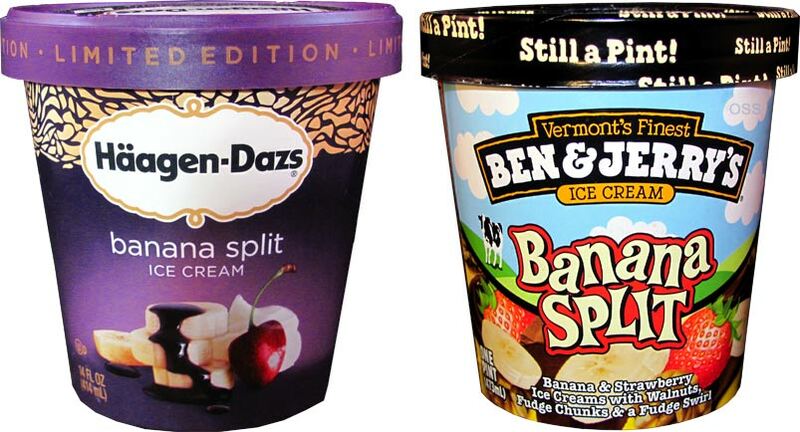 Since both B&J and Haagen are not in my area with banana split flavor, I have tried the premium brands. I've looked high and low for a super premium banana split but just not in my area. I've tried Turkey Hill, Friendlys, Walgreens, edys, and Blue bell. I absolutely love Blue bell and Turky Hills. What I love about Turkey Hill is they have strawberry with fruit chunks, banana with fudge swirl, and chocolate ice divided into 3 so you get the feel of actually eating a banana split. Blue bells was all combined but was still pretty great! You should def try those! To the Moon, I really wish Blue Bell would get into the 21st century and have an internet presence so I could inquire about getting sample since they're not in the North East. I've seen Turkey Hill's though and guess that should be my next one to try.